Marine biologist Caroline Cronin was remembered in Plymouth as her husband and daughter launched a Christmas appeal for the charity Brain Tumour Research. 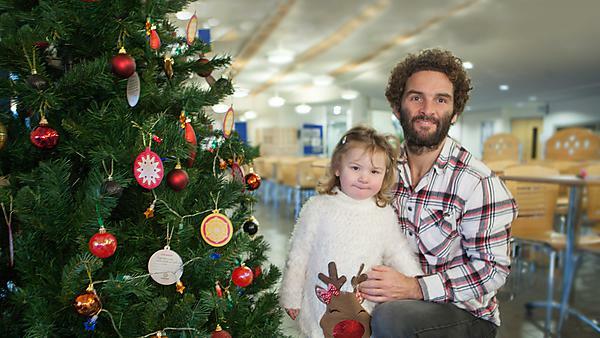 Marcus, 36, and Florence, two-and-a-half, are inviting people to take part in the charity’s Hope Tree Appeal at its Centre of Excellence at Plymouth University. Caroline worked at the National Marine Aquarium and was studying for her masters at the University when she was diagnosed with grade 4 glioblastoma multiforme (GBM), the most common and aggressive form of brain tumour. She set her heart on getting married and having a baby and achieved both these things before her death in October 2013 at the age of 32. Marcus, who teaches media at Lipson Co-operative Academy, marked the second anniversary of Caroline’s death by completing a 120 mile running challenge in Portugal. He followed the Rota Vincenta coastal path, setting out from Sagres where the couple spent their first holiday. He finished in Sines where they had their last holiday together while Caroline was expecting Florence. The event raised more than £5,000 for Brain Tumour Research and the Marine Conservation Society. This Christmas, little Florence and her father are hoping for a brighter future for other families who are affected by brain tumours. They are inviting people to join them in fundraising to support the vital work of the centre by sending a donation and writing a message of hope on a bauble. The decorations are being hung on Hope Trees at Plymouth University and the other Brain Tumour Research Centres of Excellence at the University of Portsmouth, Queen Mary University of London, Imperial College, London and at the charity’s HQ in Milton Keynes. The research team in Plymouth are focusing on identifying and understanding the mechanism that makes a cell become cancerous. They are exploring ways in which to halt or reverse that mechanism. An innovation will be testing new drugs in human primary cell cultures leading to innovative phase 0 trials. It is hoped this will be followed by adaptive phase II/III trials with the potential for making drug therapies available to patients safely and more quickly. A day of research costs £2,740, while £1,000 helps publish peer-reviewed papers and £300 pays for the specialist equipment required for one day of research. Supporters are invited to donate from £10 upwards to take part in this inspirational display of hope.